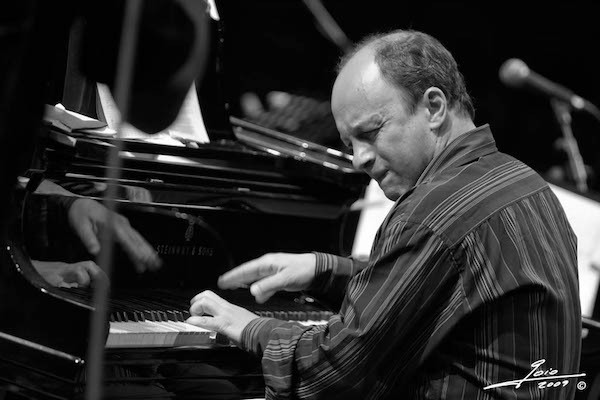 Helio Alves was born in São Paulo, Brazil, in 1966 and started piano lessons at age 6. Following his early immersion in playing the pop standards and classical music favored by his parents, he gravitated to jazz in his teens. Alves moved to Boston at age 18 and received his BA in Professional Music in 1990. He decided to stay in Boston following graduation, and there met trumpeter Claudio Roditi, who advised the 24-year old pianist to move to New York City, and urged him to get in touch when he arrived. Alves eventually moved to New York City in 1993. Since then Pianist and composer Helio Alves has received high praise as an in-demand sideman with Joe Henderson, Yo-Yo Ma, Claudio Roditi, Paquito D’Rivera, Gato Barbieri, Dave Samuels, Airto Moreira & Flora Purim and Oscar Castro-Neves, to name but a few. Alves has recorded two Reservoir releases with Roditi, Samba Manhattan Style (1995) and Double Standards (1997). He is also featured on Roditi’s 2009 release “Brazilliance X4 (Resonance). He’s also been featured on recordings and tours with Slide Hampton, Louis Hayes, Santi Debriano, Hendrik Meurkens, Caribbean Jazz Project, Trio da Paz, Paul Winter, David Sanchez, Harry Allen, The New York Voices, Gato Barbieri, Andy Narell, Mike Stern and Dave Samuels, among many others. No Replies to "Helio Alves Quartet"